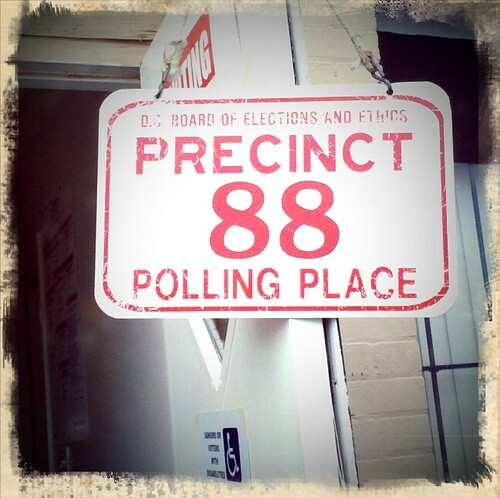 Precinct Eighty-Eight, originally uploaded by Madame Meow. I don't even know how to describe it, but today was one of the most thrilling days of my life. Today I had an interview for graduate school (*squee*), and sometimes I would become so incredibly excited that no voice would come out-- all that would manage to squeak out of my throat was an excited squawk. And then, as if that were not exciting enough, I got to vote. Ninety years ago, as a woman, I would have had to be content to know that maybe my husband and I shared an opinion, but I would have not been able to voice it. I know this means little to some. But the fact alone that I, as a woman, can be independent of thought and means, well.... it means the world to me. Today is a wonderful day. I hope you all get to live a day as wonderful and pride-inducing as this one was for me. Unrelated: tequila, lime juice and ice are also excellent. Congrats on the interview! And on realizing that a combination of tequila, lime juice and ice is the perfect remedy for a squawk! Congrats on the interview. Wishing you all the best and that this will be only the first of many wonderful days to come. My Mom isn't 90 but she remembers how the idea of a woman wearing pants was still frowned upon when she was a young girl. She's happy that she can wear pants as much as she likes nowadays. Although she does like getting dressed up. I've often talked with my daughter about the differences between my Mom's society while growing up, my society, and hers. She's much more aware of the fact that the freedoms she enjoys today were fought by her relatives only 2-3 generations back than many of the other young people she talks with. Women have come a long way in less than a century but there are still lingering social attitudes that we need to get rid of - like body image, needing a man to be fulfilled, and seeing being smart, independent, and strong-willed as good things for a female to be. My grandmother once told me that I was lucky to grow up in a society where I could speak my mind. She was very strong-willed in her own home but couldn't bring herself to speak her opinions outside it. That was the way she was brought up. She just couldn't change her ways after so many years. She never wore pants either. Dreary Driving the Point (Day two hundred eighty-seven), originally uploaded by Madame Meow. Sometimes you don't want to write because you're afraid everything that comes out of your mouth or flows out of your fingertips will be tinged with sadness. Writing stops being a relief and a comfort: it becomes a chore that looms. And then it rains and it turns cold and the sun does not appear for eons, and it's like life is validating you. Back on the saddle now.